Dragons love all sorts of tacos—except spicy ones! When a boy throws his new dragon friends a spicy salsa taco party, red-hot trouble ensues. 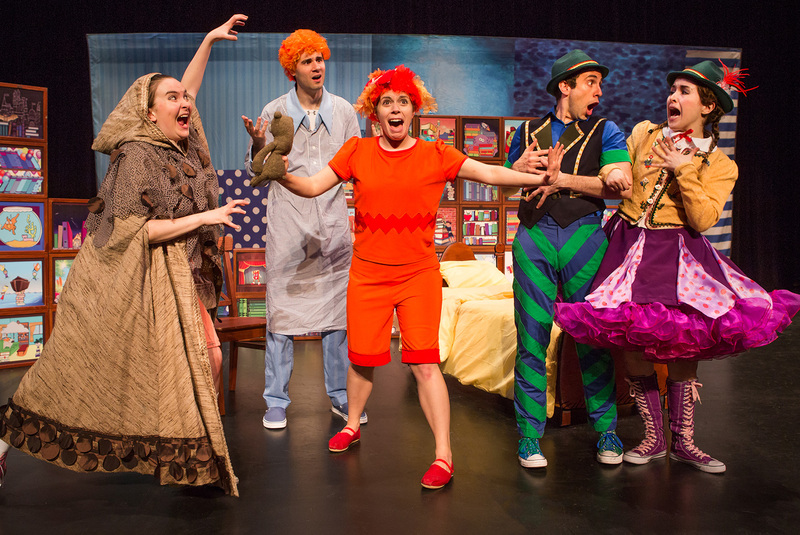 In their newest musical revue, Theatreworks USA rocks out with a rollicking interpretation of Dragons Love Tacos and four other beloved children’s books: Interrupting Chicken, The Dot, Mercy Watson Goes for a Ride, Cowgirl Kate and Cocoa School Days. Dragons Love Tacos by Adam Rubin: Dragons love all sorts of tacos—except spicy ones! When a boy throws his new dragon friends a spicy salsa taco party, red-hot trouble ensues. Mercy Watson Goes for a Ride by Kate DiCamillo, Illustrated by Chris Van Dusen: Mercy the pig and Mr. Watson go for a ride every Saturday in Mr. Watson’s automobile. But one Saturday, guess who winds up behind the wheel? Cowgirl Kate and Cocoa School Days by Erica Silverman, painted by Betsy Lewin: Yee Haw! Cowgirl Kate and her loyal horse Cocoa are the perfect pair. They do everything together, until school is in session—and horses are not allowed!